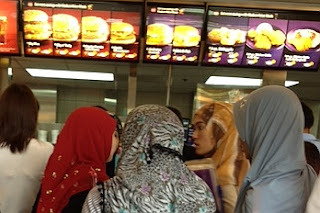 Backpacking Philippines: Muslims in Makati: McDonalds Halal Food? 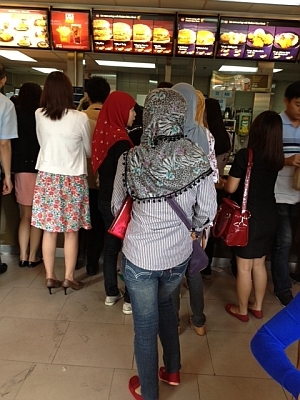 Muslims in Makati: McDonalds Halal Food? While Tutubi was with officemates/friends at McDonalds Paseo Center (Makati), he noticed this group of four women, apparently Muslims due to their use of hijab (head scarf) queuing at the counter while also talking to each other probably choosing their order. What comes to mind is this question: "is McDonalds now certified as halal food in the Philippines? or these ladies with hijab do not have much choice as it's really hard to find Halal Food in Manila for our Muslim brothers. Understanding Halal 101 for non-Muslims: halal food, when packaged and sold must have the proper label/certification from a Halal certification authority. For food served in restaurants, food must not contain pork (and other haram: forbidden items), and must never get in contact with haram food including oil from pigs (lard). If it's an animal meat, the butcher must be a Muslim and has to recite a prayer during the butchering process. at least now the four ladies probably decided which one to order. Tutubi thinks the Department of Tourism, and Filipinos in general, should grow the halal food industry in the country along with more hala food choices in Manila and other tourist spots like Boracay to be able to lure more wealthy Muslim tourists from the Middle EAst and other predominantly Muslim countries. Malaysia has been very successful at this they're currently at the top of tourist arrivals in ASEAN.